Bluefox Casino will then reward you with a bonus (Welcome Bonus is for new players only). The terms and conditions of the bonuses vary between different casinos and might also change over time and between different countries, so it is important to compare the different offers and read the T&C for Bluefox Casino before signing up. 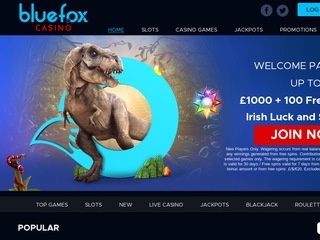 Progress Play launched BlueFox Casino in 2017, using a blue and black colour scheme that doesn’t particularly stand out to the eye, but at the same time, it helps to highlight all the various buttons. Everything is labeled cleanly, allowing players to easily access the parts of the casino that they’re interested in. When you first land on the page, you have a large banner displaying a new player promotion, and right beneath, direct access to all the video slots, table games and live casino titles you could possibly want or need. The casino has great support for mobile users, who only need to go to the website to be immediately redirected to the mobile version of the casino, allowing not only iOS and Android users access, but also Windows Phone users. While the big welcome banner is clearly the most eye-catching part of the casino, you’d be hard pressed to miss the big Log In and Sign up buttons in the upper right corner of the screen. Still, BlueFox Casino allows you to look through it’s wide selection of games – either one featured on its front page, or in specific categories if you choose to sort by what’s most important to you. There are no previews you can see, and you can’t demo play at all – any access to the games requires you to register an account and log in first. 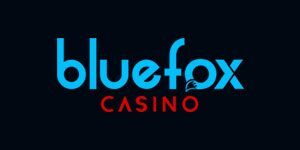 BlueFox is licensed in both Malta and the United Kingdom by the Malta Gaming Authority and United Kingdom Gambling Commission, respectively. The casino offers players English, German and Swedish as supported languages. It also utilizes the latest 128-bit Secure Socket Layer (SSL) encryption and firewall technology to ensure sensitive customer data is transferred securely over the internet. If you choose to gamble at BlueFox Casino, you won’t be starved for choice. The casino offers games from NetEnt, NextGen Gaming, Microgaming, Amaya, NYX Gaming, and a whole host of other slot providers. They also use Microgaming’s titles for instant play casino games. Overall, you have a choice of over 300 games, most of which are video slots. The sheer amount of games available is somewhat mind-boggling. Going into the slot section, it’ll take you a while if you choose to scroll down to find the end of the list, as it will keep loading more and more titles for players to enjoy. There’s not much in the way of sorting by a specific developer or slot characteristics, like the number of reels, or specific features. The search function they offer is useful if you have a partial idea of what a game you’re looking for might be called, but beyond that, you’ll have to start it, try it out, and see if you like it. Each of the most prominent table games finds itself with its own category in BlueFox casino. Blackjack, Roulette and Video Poker all have their own sections. We counted fifteen different Blackjack games, fourteen different Roulette titles, and five video poker games. We’re quite pleased with this in the grand scheme of things, as it allows players to search for things that specifically interest them, instead of forcing all of these games to share the same category. We weren’t able to find any other games available on BlueFox Casino, except for scratch cards, which we found had seven different titles available, as well as a Keno game also situated in this category. This section seems oddly hidden, as it’s not the listed categories you see – instead, once you open one of the categories, you have to scroll down to find the Scratch Cards section in the same area as the Terms and Conditions and the FAQ, which seems like odd placement. If you’re fond of going toe-to-toe with real life players, have no fear, because there’s a fair few live casino games. The largest number of them are blackjack and roulette, but there were also two live baccarat games, which is nice, considering we didn’t find any single-player baccarat titles on offer. Gamblers can use Live-chat, which is available 24/7, or they can fill out a contact form to be contacted via e-mail over any troubles they are having.